OSWEGO, NY – The Oswego Fire Department responded to a reported fire in a trash can at the Byrne Dairy located at 99 W. Bridge St. tonight (June 17). According to fire officials, an employee was alerted to the fire around 7:20 p.m. The employee saw smoke and fire coming from an area near the gas pumps and immediately activated the overhead extinguishment system. A customer was pumping gas nearby, but was not injured. Firefighters washed down the trash can with water to ensure the fire was out. 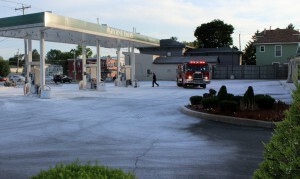 The gas pumps were isolated and shut down, and customers and employees were checked for injuries. Byrne Dairy officials stated the store would remain open this evening, but the gas pumps would remain closed until the extinguishment system can be recharged and inspected. 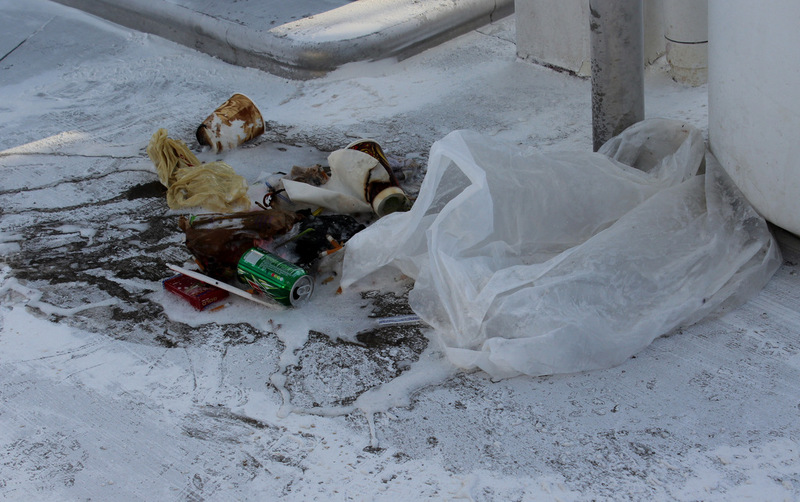 The dry powder covered the entire parking area, and even spread across Bridge Street. Store employees were cleaning the area at present time. According to the Oswego Police Department, the fire is under investigation at this time. Although this was a small fire, it had potential to be a disaster if gasoline fumes had ignited. Thankfully, the gas pump closest to the trash can was not in use at the time of the fire, fire officials said. THIS is the reason we need ‘smart pumps.’ IF anyone is near with a cigarette, and signs should be posted EMPHASING NO CIGARETTES near there, maybe, just maybe idiots will listen. I have actually seen people smoking in their cars while someone else pumps at more than one station in the city. We no longer take much seriously…there was a time we ‘respected’ gasoline for what it is, FLAMMABLE! I think the person smoking near the pumps, should be held accountable. The individual is obviously on camera, with license plates recorded. They should be financially responsible for the recharging fees of the stores extinquishers as well as the extra time it took to clean this mess up. They should be held accountable for a bad decision. Again, this society is teaching everyone there is not ramifications or consequences for their action. My mother always said, “if you want to play, you gotta pay”. There can be no mistakes about smoking at a gas pump…. I didn’t read where it said it was a smoker. But I did read that it was started by a very sick deranged person that would put so many peoples lives at risk. I agree that this person should pay for for all cost to Byrne Dairy and the fire Dept. and Jail time for arson. A very serious situation indeed. You would think any combination of potential ignition and gasoline could result in fire just out of common sense. Almost makes you wonder why simply starting a car after fueling couldn’t do the same thing in an unusual circumstance, much like a pilot light on a furnace and chemical vapors. On a lighter note (pardon the pun), maybe that’s why it’s called “Byrne” Dairy? This would seem to be another good reason to actually have station attendants pumping gas like they did in the old days instead of any clown who pulls up to the pump, (even though accidents could still happen). At least they could tell you to shut off your vehical if you didn’t read the sign. These incidents don’t happen too often considering the number of people using gas pumps daily, and are usually caused by other things such as static electricity. I can still remember an Oswego girl and I think her mother who were killed in a gas pump fire somewhere in the southern states back in the mid 1960’s. I knew her, but will not mention any names.